JoeLanta and The Great Atlanta Toy Convention: 1 Day To Go! With one day before the big show, I want to talk about one of the cool guests who’s a regular at JoeLanta and The Great Atlanta Toy Convention. 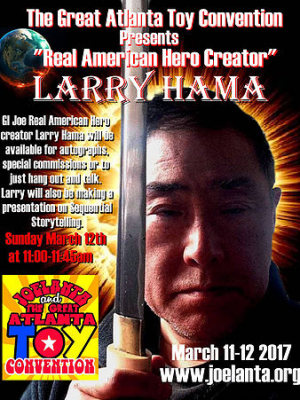 Larry Hama is a writer/cartoonist/editor who created the characters and storylines for GI Joe: A Real American Hero, the 1980s version of GI Joe. His panel happens on Sunday, and it’s going to be jam-packed. Larry’s also done a ton of other work in and out of comics. He’s been a musician, an actor, an artist, writer, editor and created Bucky O’Hare, and I first encountered him in the comic strip section of the classic National Lampoon magazine. Larry’s panel at JoeLanta will feature him talking about sequential art and storytelling. His panels at JoeLanta are always informative and entertaining. Larry is even being immortalized in action figure form. 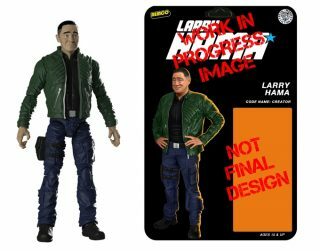 Fresh Monkey Fiction has a Kickstarter campaign, which has already exceeded its goal with more than two weeks left, that will see a GI Joe-style figure, complete with backing card, made of the esteemed Mr. Hama. You can find details HERE, and check out the prototype figute at left. You can see Larry in action below in video recorded at previous JoeLanta conventions, here’s Larry talking about the famous “Silent Interlude” issue of the GI Joe comic book, plus video of him taking questions and walking us through a set of storyboards he did for Boardwalk Empire.